This bit offers for additional comfort, as the series of rounded links allow the horse to swallow and move the tongue freely. The rider should never 'see-saw' with this bit as the bit will become very severe. The Waterford is usually selected one size larger than the horse's normal bit size, providing comfort and freedom. This bit from Lorina is made from highly polished stainless steel to prevent rusting and improve durability. 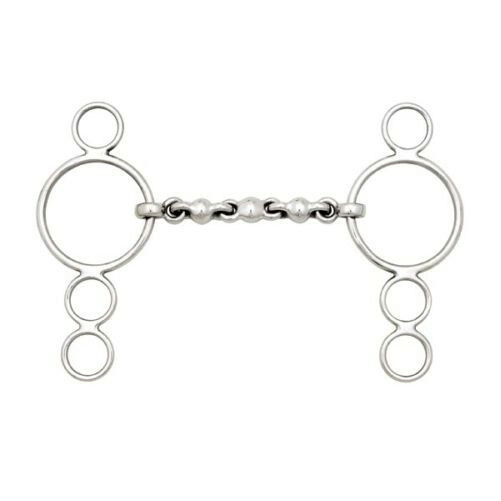 The 4 ring bit should be used with two reins; one on the main snaffle ring, with the other on either of the two lower, smaller rings, depending on the required poll pressure. There are currently no questions for Lorina Continental 4 Ring Waterford - be the first to ask one!